Airmodel 1/72 Helio U-10B "Psy-War Version"
The Helio Courier was the best-known (if that can be said about a fairly obscure aircraft) product of the Helio Aircraft Corporation, founded in 1948 to develop a STOL (Short Take-off and Landing) utility aircraft. If Wikipedia can be trusted, 60% of the Helio Couriers built were delivered to the US Army and Air Force, as L-28A/U-10A, U-10B and U-10D models. The Courier was also used extensively in South-East Asia by Air America, the CIA's in-house airline. The Courier's outstanding short-take off and low-speed performance was due to the large trailing edge flaps and nearly full-span leading edge slats. These features enabled the Courier to operate out of very short unprepared airstrips, such as the numerous Lima Sites dotted around Laos. In addition to acting as a light transport, the Courier could also be equipped with a loud speaker and leaflet chute for psychological warfare. Helio developed a turboprop version of the Courier as the Helio Stallion. This was evaluated by the USAF as the AU-24A mini-gunship, and a small number were supplied to the Royal Khmer (Cambodian) Air Force. Long before the current heyday of limited run injection moulded kits, Airmodel of Germany offered an extensive range of vacuforms, covering a mix of Luftwaffe and post-war American subjects. To this day, many of these have yet to be offered in any other medium. 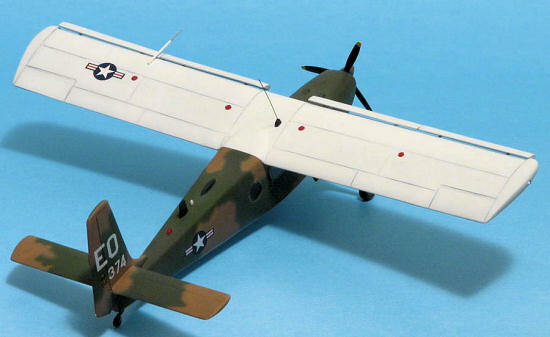 In the late '80s, Airmodel briefly moved into the realm of injection moulding, offering at least two kits - a Culver PQ-14 target drone, and the subject of this review, the Helio U-10 Courier. (The box of the kit lists as 'in preparation' a Helio on floats, a Commonwealth Wirraway, a Sikorsky R-4, and a couple of Focke Wulf Fw 190 varia nts - were these ever released?). The copyright date on the instructions of my kit is 1989. I should note that I have never seen this kit for sale - I picked mine up second hand (thanks Haydn). The kit is presented in a surprisingly professional full colour box (reminiscent of Italeri), and comes complete with decals. Given the Courier's extensive fuselage windows, Airmodel decided to mould the entire fuselage, along with the tailplanes, landing gear fairings and many small parts in clear plastic. 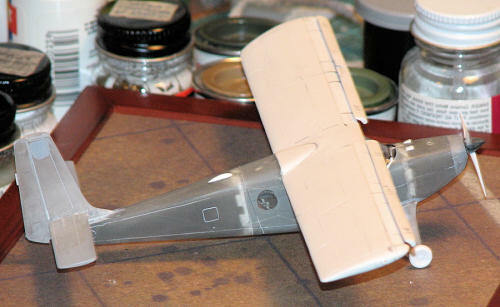 The wing, prop, wheels and interior parts are provided on a second sprue of white plastic. The moulding quality is variable - the major parts are decent, but the surfaces of many parts are pitted. The trailing edge of the wing is very thick. Many small parts, such as the tailwheel and control wheels, are not fully moulded, while others, such as the prop, are marred by sink marks, or embedded in flash. The mediocre quality of the parts is somewhat made up for by the instructions - three double-sided photocopied A4 sheets, with a history in German and English, a numbered parts map with a list of the parts (no part numbers are given on the sprues), a three-view copy of the U-10 camouflage scheme from Technical Order 1-1-4 with modelling paint references, an exploded view drawing of the parts, a sketch of the interior structural framework, and finally two pages showing the decal options, with 1/72 scale profile and elevation drawings. This last item came in very handy, as the drawings are very detailed and accurate. Finally, the kit includes a small decal sheet, offering stars and bars, tail codes, and serial numbers for three aircraft - two U-10Bs and a U-10D. I started by cleaning up the major parts. I sanded and polished the clear fuselage halves inside and out. The kit interior provides seats, a floor, an instrument panel, and two control wheels. The control wheels were poorly moulded, so I scratchbuilt replacements. I also detailed the control panel based on photos from the web. I used the kit seats, with added masking tape belts. The instructions provide a scrap view showing the tubular fuselage framework. I painstakingly reproduced this with Evergreen rod, before realising that there typically is an interior skin covering this structure! When painting the interior, I masked the insides of the windows. I traced the window outlines on a piece of Scotch tape, then cut the masks out and applied them to the inside surface. next step was to fit the windscreen. The kit part was thick and uneven. Nothing a little polishing couldn't fix, or so I thought! After an intensive polishing session, I split the windscreen in two, right down the centre-line. Basically, at this point, I gave up on this model for about five years. Determined to get this kit off the workbench, I tried several times to replace the kit windscreen with a thermoformed part. This involved a lot of trial and error, and I eventually determined that the kit part was pretty poorly shaped. In the end, I had to extend the upper surface of the engine cowl back over the instrument panel coaming by several millimetres, using scrap plastic and lots of gap filling superglue. I thermoformed my new windscreen over a carved balsa mould. With lots more superglue, sanding, filling and polishing, I managed to get this faired in, and looking half decent. Moving to the tailplanes, the kit parts were cleaned up, and drilled to accept wire mounting pins. There are no alignment pins or mounting tabs on any of the kit parts. I used a razor saw to open the gap between the top of the vertical tail and the rudder mass balance, as this gap is evident in photos. I also added a small rudder trim tab and a white position light at the base of the rudder. At the front end, Airmodel provide a separate nose cap, and a cooling flap for the underside. 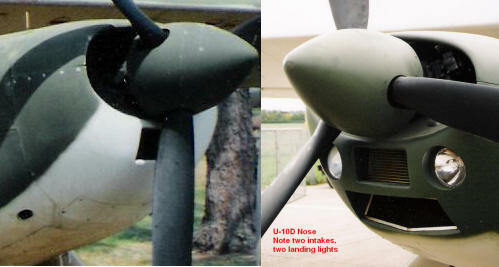 Carefully examining photos showed there are differences in the cowl between U-10A/B and U-10D aircraft. The kit reflects the U-10A configuration, with a single intake below the prop, and no landing lights. I wanted to build a U-10D, so I cut away the chin, and rebuilt the second intake. I also drilled out holes to later fit landing lights. I've included two photos to show the difference in the intake configuration. I replaced the cooling flap with thin sheet, and added twin exhaust pipes from Evergreen rod. The kit prop was marred by a huge sink mark in the hub. I couldn't find anything in the spares box that was could be used as a direct replacement, so I sanded down a Matchbox Twin Otter hub, and fitted the kit blades to it. first removed the slats from the wing. I carved the removed leading edges to create the slats. I then glued some Evergreen rectangular section stock to the leading edge, and rebuilt the section under the slats. I glued two short lengths of wire into the leading edge of the wing to support each section of slat. The kit offers a choice of faired or exposed main landing gear struts. The unfaired struts are pretty crudely moulded, and are best replaced with metal wire. The aircraft I was modelling had the faired struts, so I simply added some wire pins to the kit parts to strengthen the mounting points. The end of the strut simply rests on a moulded ledge on the back of each wheel. I was lazy and didn't reinforce the joint, using plenty of superglue instead. The tailwheel was incompletely moulded, so I build a replacement with Evergreen rod, tube, wire, and lead foil. As part of its Psy-ops role, the U-10 was fitted with a loudspeaker on the port side, and a leaflet chute. I rebuilt parts of the kit speaker to improve the detail, though I lacked specific references on this particular style of loud speaker. The kit includes a square cut-out in the starboard rear door, which removed as I could find no supporting reference. I added a belly mounted leaflet dispenser chute, as seen on the USAF museum example. I filled almost all the fuselage panel lines, as I couldn't find a way to give them a consistent appearance. At the last minute, I found another flaw in the kit. The fuselage halves are moulded with a front door on the port side, and both a front and rear door on the starboard side. The correct configuration, as shown in the scale drawings in the instructions, is a front door to port, and only a rear door to starboard. This necessitated another round of filling and sanding to address. I'd recommend trying to fix this before the fuselage halves are assembled, and definitely before the wing is added! The kit offers decals for three aircraft - two U-10Bs in the standard SEA camouflage scheme, and a U-10D in the same scheme, but with a white upper wing. As I had a good quality photograph of the U-10D, plus detail shots of the USAF museum aircraft finished in the same markings, I elected to go for this version. After priming, I painted the white wing using Model Master flat white enamel. When dry, I masked this, then painted each of the four colours of the SEA scheme in turn. I used Model Master enamel for the Camouflage grey undersides, and Humbrol enamels for the tan and greens. All the colours were sprayed freehand with my Paasche H single action airbrush. Looking at photos, it is apparent this aircraft didn't exactly match the specified scheme as printed in the instructions or in T.O.1-1-4. I modified the pattern slightly to more closely match the photos. After the main colours were dry I sprayed a coat of Micro Gloss in preparation for decals. I find this gloss does not yellow significantly, important with the white upper wing. I was pleasantly surprised with the (then) 17 year old kit decals. After trimming excess carried film, they went on without a problem. The stars and bars were in perfect register, and the white tail codes and serials were opaque. After the decals had dried overnight, I applied a coat of Polly Scale clear flat. I found this frosted slightly, a problem I have had occasionally with water-based clear flat coats. I buffed the model slightly with an old shirt to give it a slight sheen, as evident in some photos. Final construction involved installing the slats and prop, and adding the aerials, which were mostly made from stretched sprue and scrap sheet. I also added a red beacon on the spine, carved from a piece of clear red sprue. The wing tip lights were touched in using Tamiya and Gunze clear colours. The nose mounted landing lights were added from polished pieces of clear sprue, glued in place with Krystal Klear. I couldn't find a definitive picture as to how the pitot tube was mounted, so I took an educated guess and attached it to the top of the port wing, so it would clear the retracted slats. Finally, the pilot's boarding step was added. While I think the U-10 is a great looking aircraft, and I'm very glad to have a model of one, I would think twice about building another. I would recommend this kit only to those dedicated to having a U-10 in their collection. It would be great to have an AU-24 in the collection to park it next to!